Is it a Real Box or is it VirtualBox? provides a performance overview of the latest version of VirtualBox. Both VirtualBox 3.0.4 vs. VMware Workstation 6.5.3 and VirtualBox 3.1.2 vs VMware Player 3.0 (First Class Flyer) provide objective and subjective comparisons. This weekend I also downloaded Ubuntu 10.04, although I have not had time to try it yet. In the past I tended to buy high-end laptops on the basis that they would last for longer. This worked to a certain extent, but this time I want to try a new approach. I am going to buy a relatively low-end laptop, but replace it more frequently. The disadvantage of this approach is that it is very time consuming to setup a new computer. Moving my computer from one piece of hardware to another becomes trivial. This is useful for when I want to upgrade my laptop in the future. It also means that I can put my computer onto an external hard disk. Backing-up my computer also becomes trivial. I am thinking about backing it up automatically every night! Snapshots can be taken before I install any software on a test basis. I can then roll-back my computer if I do not like the new software. It provides my computer with a lot of extra security from network based attacks. I want to start using the Ubuntu based virtual machine as my main computer. I am waiting for Lucid Lynx 10.4 LTS. 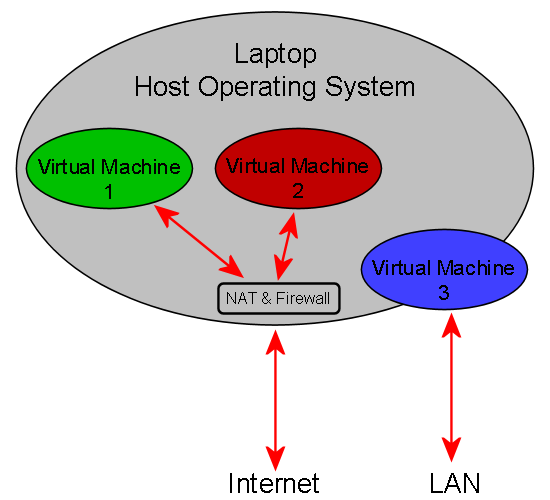 I will use NAT to network all three virtual machines most of the time. However, sometimes I will need to use the Windows 2000 virtual machine in bridged mode so that it can be a first class member of my domain. Now that I know what I want to achieve, I just need to find the best way to realise this! I am currently considering buying either a Dell Inspiron 1545, Inspiron 15 Intel Core i, or a Studio 15. I am a Dell fan, and a 15″ screen is the best size for me. I will get 4GB of RAM, and either a 350GB or a 500GB hard disk. I will get one of the cheapest processors available. I am currently considering either the Intel Pentium Dual-Core Processor T4400 or the Intel Core i3-330M. I will probably choose the latter, because it seems to have better support for virtualisation because it supports VT-x according to its specification. In practice I do not know if this will provide a noticeable benefit. In terms of form-factor, I dislike the idea of a number keypad on a laptop. Therefore, I will probably go for a Studio 15. I wonder how the host operating systems sees the integrated web camera. I hope that it appears as a standard USB device, so that it can easily be shared with the virtual machines. It must be very secure, because I will use my laptop in a lot of public networks. It must be easy to connect to file servers. This is important, because I will need to back-up my virtual machines. It must have a software based firewall that is very easy to configure precisely. The only question I have is whether I should use the 32bit or the 64bit version of Ubuntu? The two options that I am considering for this are VMware Workstation and VirtualBox. My main requirements are that the virtual machine software is secure, and that it supports VT-x. I think that both do! Should I use the 32bit version or the 64bit version? Will they both support my hardware equally well? Is there a risk of becoming locked into one of these products? How is Hyper-threading supported? Presumably, the virtual machine software would think that it has four cores to distribute to the virtual machines. However, in reality it would only have two. This makes me think that I should disable Hyper-threading. Does the virtual machine file format change with each new release of the virtual machine software? As I wrote above, I will use Ubuntu, Windows 2000, and Windows XP on my virtual machines. Should I choose the 32bit or the 64bit version of Ubuntu? Will the OEM version of Windows XP that I got with a previous Dell computer install into a virtual machine without lots of registration issues? If anybody has any opinions, experience, advice, or answers relating to any of this then I would love to read them! I recently tried to avail of a Kellogg’s promotion. The promotion involved collecting 3 unique numbers from 3 different cereal boxes, entering these number online, and then printing a voucher for the free box of cereal. It all sounded wonderfully simple, but it turned out to be a disaster! In fairness, it is not all Kellogg’s fault, because it chose two other companies to fulfil the promotion. Coinks was responsible for redeeming the collected numbers, and converting them into rewards. Couponstar was responsible for providing the printable vouchers. It is really this company that I am faulting! In theory this should be a very simple process. Simply generate a PDF file that the user can download and print. However, Couponstar take a very different approach to this simple task. Its motivation is that it prevents users from printing the same coupon multiple times. It appears that this company has never heard of a photocopier! I used another computer, and then discovered that virtual printers are not supported (I was trying to print to a PDF file). I then tried to avail of the offer from a Windows computer in work. The application downloaded and installed. It then displayed a message saying that my vouchers would be printed shortly. The only problem was that it did not specify on which of the company printers (in separate parts of the building) my vouchers would be printed! Ultimately, it did not print on any of them. Perhaps this is because the software could not communicate with the server, because it never asked me to specify my proxy settings! At this stage I gave up! I will update this blog if I get a response from Kellogg’s. I recently wrote that I intend to start using either Ubuntu or Kubuntu as my desktop operating system in Ubuntu or Kubuntu. Since then I have downloaded the 9.04 version of both operating systems. I installed both of them simultaneously on my main computer as guest operating systems using VMware. I also installed each of them as the main operating system on a spare computer that I have. Both operating systems install very easily with very little user interaction, and they both correctly identified all of my hardware. That impressed me, because I often hear horror stories about Linux and hardware! After using both operating systems for the last few days I have come to the conclusion that they are both excellent. However, I need to choose only one of them! So ultimately I am going to choose… (drum roll) … Ubuntu! It seems to have much more official support. It seems to have a greater user-base, and therefore there is more information about it online. I felt that the applications that came with Ubuntu were more complete. I generally prefer applications that have very limited, but specific, functionality. The greatest appeal of Kubuntu was the lovely KDE interface. I thought that the default GNOME interface was very bland, but luckily it is very configurable. I will blog about the changes that I made to it. I found solutions to all of my initial problems online. The Internet really is great for these things! However, there are some deployment type issues that I do not know how best to deal with them. On my Windows installations I like to create three logical drives: The C drive is used for the operating system; the D drive is used for the applications; and the E drive is used for the data. Ideally the C drive is on its own dedicated physical disk for performance reasons, and all other logical drives can be on a single physical disk. The use of these logical drives makes upgrading very easy. I do not yet know the best way of configuring an Ubuntu installation with multiple physical and logical hard disks. On my Windows installations I store all my data in a single logical drive. Therefore, there are two locations that are associated with my user account: my settings and my data. My current understanding is that my user settings and my user data are all stored in the same location in an Ubuntu installation. This seems a bit messy to me! I currently use the roaming profiles features of Windows so that I can log into any computer on my network and I will have my most recent settings. I do not know how to implement this on an Ubuntu installation. My current intention is to keep using Ubuntu as a guest operating system until I feel confident enough to wipe my hard disk and use it as my host operating system! I will keep blogging about my progress here! The latest versions of Ubuntu and Kubuntu will be released tomorrow. These will be version 9.04, and they are known as Jaunty Jackalope. I have never used Linux as my main desktop operating system before, but I have had limited experience of using it on servers. My main reason for wanting to try it is that I am getting tired of all the bugs, security weaknesses, and limited functionality of Windows. My reasons for choosing Ubuntu or Kubuntu are that they both come ready for use, and I know that they are configured securely! So I think that now is a great time to try them! My understanding is that the main difference between Ubuntu and Kubuntu is the window managers that they use (GNOME versus KDE). However, reading the documentation they both seem to come with different application sets. This is confusing me slightly. I am also not clear why they both need to reinvent the browser! Hopefully, all will become clear over the following weeks ;) I will keep writing about my progress here!